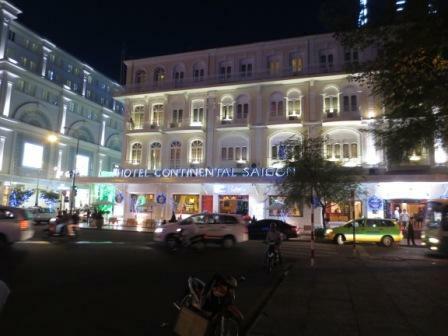 On our return to Saigon we stayed at the Continental Hotel. 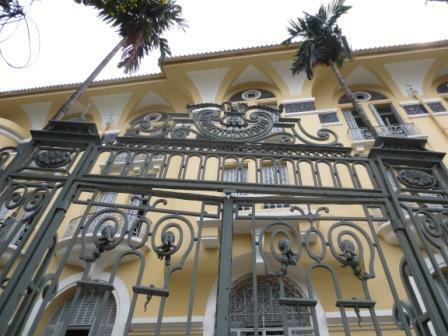 The Fine Arts Museum is a beautiful old mansion-house built for a wealthy Chinese family during Colonial times. 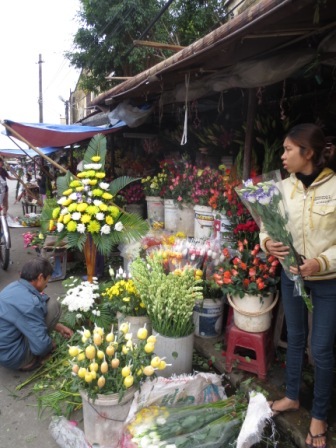 Close to Ben Thanh Market it houses a small, but beautiful collection of art. 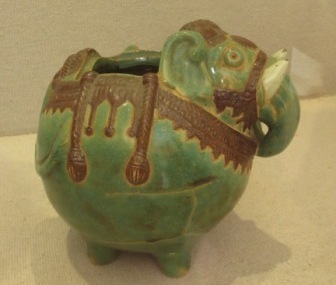 The ceramics were stunning. 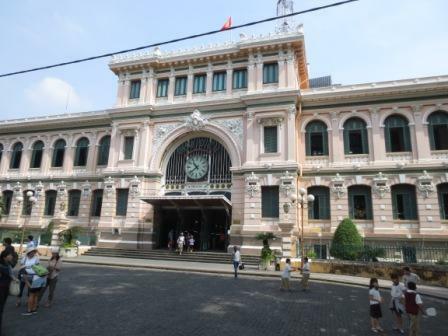 The building also boasts the first elevator in Saigon. The building itself is magnificent. 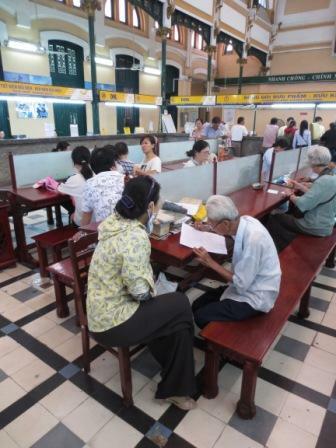 The Ben Thanh Market is a bit tacky but fun. 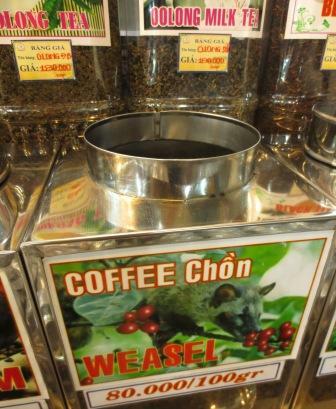 I picked up some coffee beans that have been ingested (supposedly) and then crapped out of a weasel. I think this is the poor man’s equivalent of Kopi Luwak, coffee berries that pass through a civet cat. You could have bought squirrel flavour too. I think most of it is actually produced in Indonesia. I remember Jack Nicholson drinking it in the film, The Bucket List. Strange aroma – don’t think I will ever be brave enough to drink it before I die. 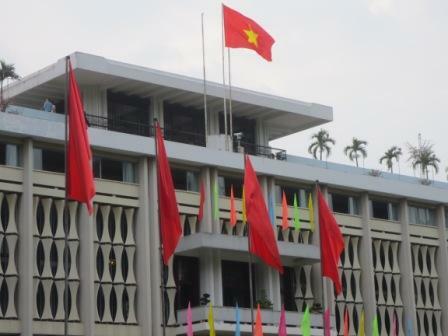 The Independence Palace was interesting. 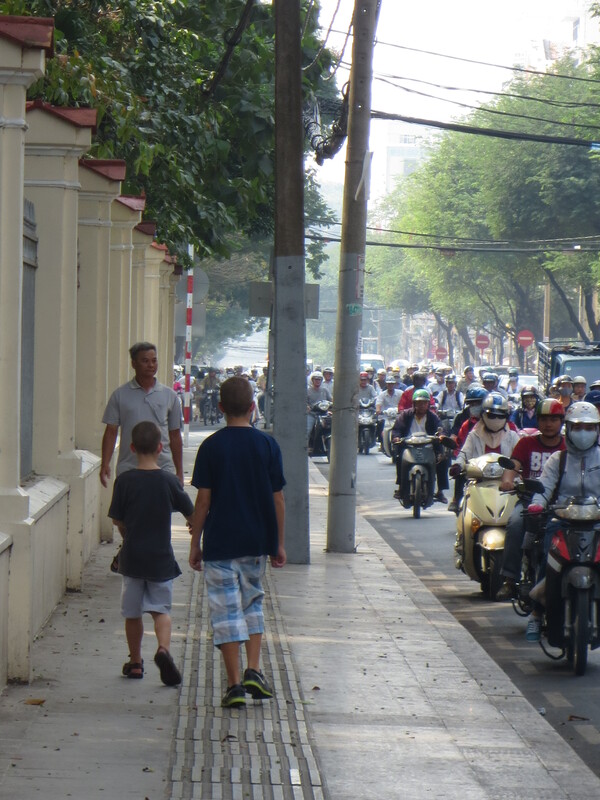 Cairo and I wondered if, when the VietCom tanks burst through the gates, they drove across the lawn – or respectfully swept round following the road? 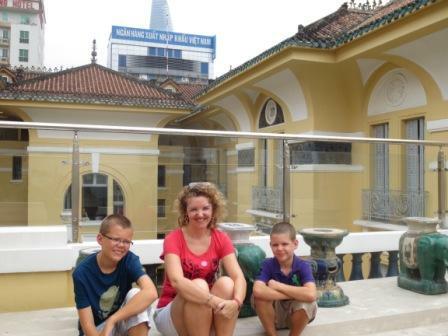 We found out later while looking at some photographs in the Museum of the Ho Chi Minh Campaign next to the zoo. 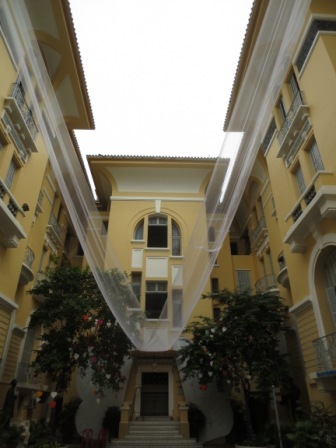 You could picture helicopters landing on the roof of the palace transporting away officials, officers, soldiers and diplomats before Saigon fell. 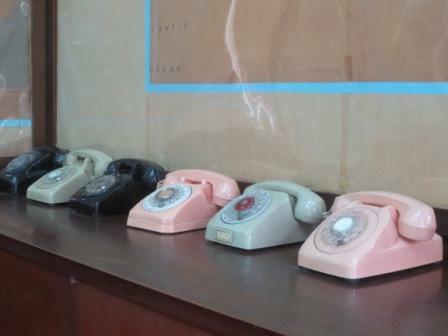 Underground bunkers still have massive radio equipment and a great line in pastel coloured telephones. 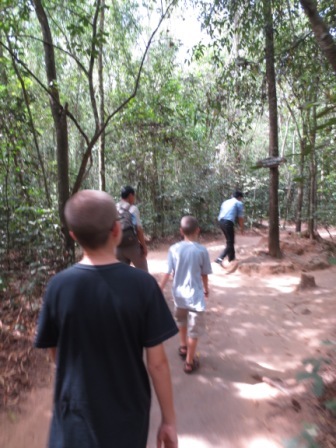 We visited Saigon Zoo and Botanical Gardens one morning. Lovely big grounds dating from 1864. 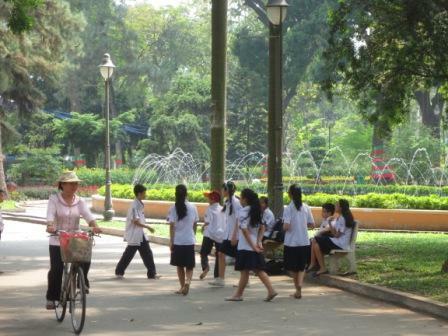 Lots of local people and school children enjoying the shade and traffic-free space. 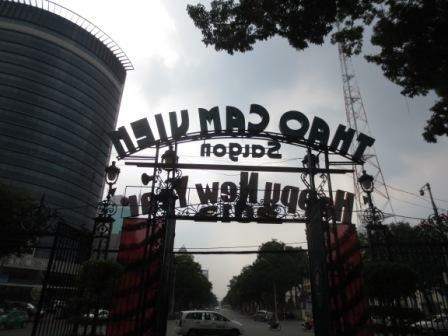 Beside the zoo is the Museum of History. Me and the boys came back in the afternoon to visit. 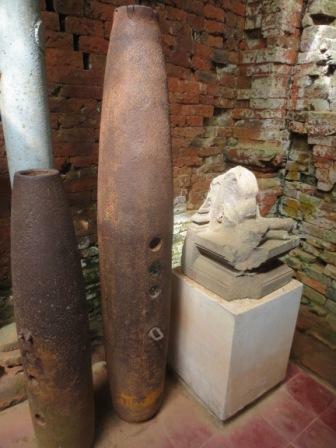 Some beautiful statues and ceramics – and a tastefully lit linga. 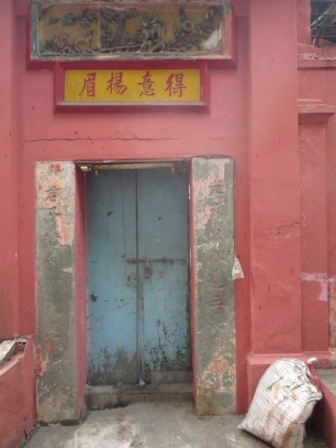 A trip to the Jade Emperor’s Pagoda (you’ve seen one…) after a birthday high-tea at the Caravelle Hotel. Amazing what you can pack into nine days. 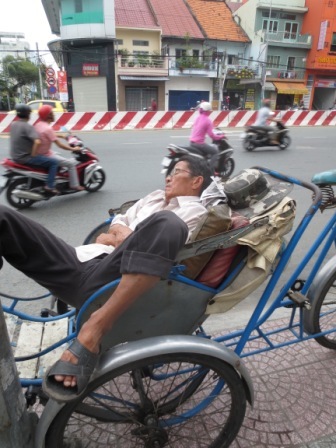 Love Vietnam. The great, wee fella is 10 years old today. 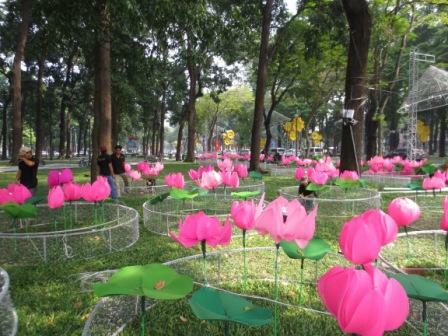 We drove East to check out Taman Mini Indonesia Indah. There’s nothing really mini about the park – once you find the main entrance off the toll road. A whole country in one park it recreates all the areas of Indonesia as well as accommodating several museums, a theatre, and a cinema. We headed for the Transport Museum. This doubles up as a recce for a proposed Year 2 visit. We could drive round the 150 hectare park. The transport museum was excellent. 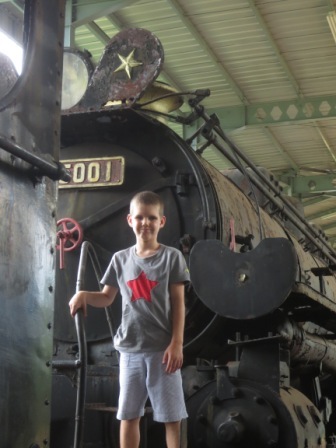 Something enjoyable about climbing over old steam engines. Then we went on the overhead mono-rail – that actually runs on two rails. 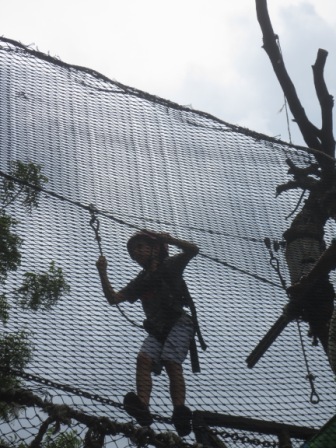 The boys had great fun on the overhead rope course and flying foxes. We will be back. 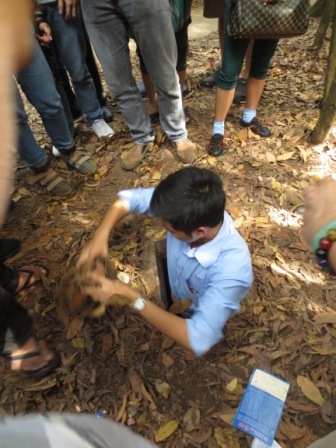 We ventured out of Ho Chi Minh on one occasion to visit the Ben Dinh underground tunnel complex in the Cu Chi district. 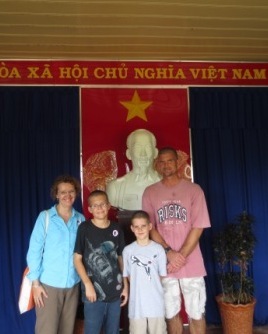 Approximately 70 km from Saigon this area was a base for anti-American resistance. This district is still referred to as the most heavily bombed and chemically poisoned place on earth. Are all bus tours the same? 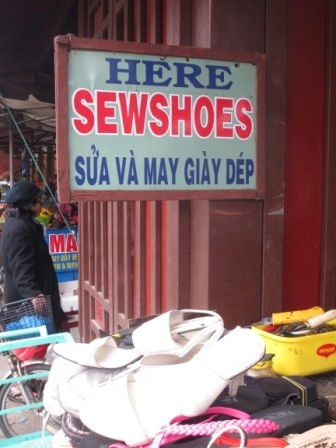 On the way, our tour bus made a strategic stop at a craft factory where people affected by (or as a consequence of) the bombing, fighting and poisoning, produce and sell a selection of things for tourist shops – and to people on the buses heading to Ben Dinh. The place was mobbed. We walked through the factory to the large shop. 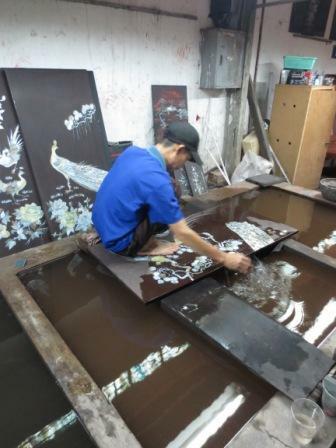 Workers were glueing down tiny hand-cut pieces of duck egg, or mother of pearl, to build up mosaic pictures on lacquered boards. It looked like painstakingly slow work and it came as bit of a surprise to see the enormous amount of merchandise for sale in the shop. Being great Tintin fans we noticed a selection of recreated Herge book covers. We bought one for a million dong – a finished version of the ones above. 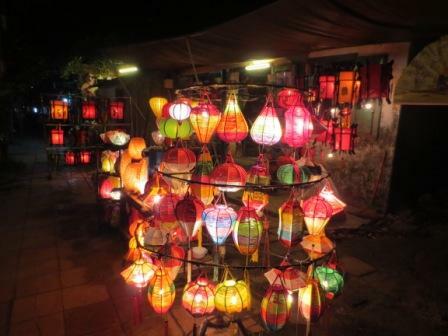 It doesn’t matter that we saw them for sale in every tourist shop during the rest of our stay in Vietnam for vastly reduced prices. Shona bought a beautiful jewellery box with an inlaid dragonfly. 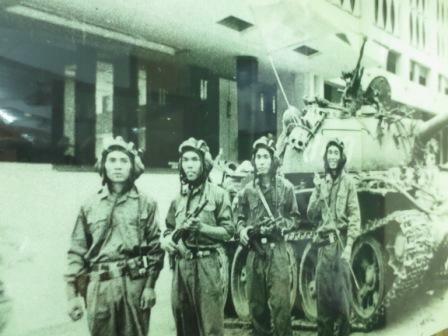 A t-shirt slogan in Da Nang airport read something like this: In the 1970s the United States was the richest country on the planet and had the most powerful military force on the surface of the earth… But, not under it. 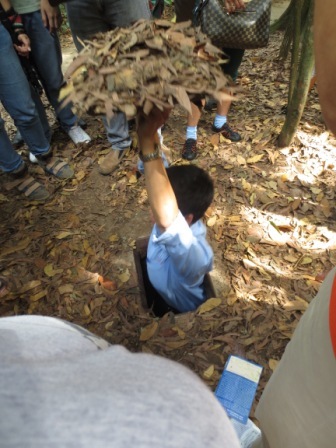 Over the years when Indochina was occupied by foreigners, the people of the Cu Chi district became experts at tunneling and surviving underground. They were the equivalent of the Gauls, resisting the invading Roman army. No magic potions, but an incredible determination to survive and resist the French and American forces – and the ability to appear and then disappear after inflicting damage. We started with a video of old footage showing some American Killer Heroes. 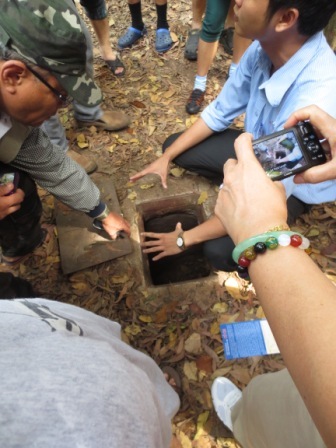 We were then shown hidden entrances, gruesome booby-traps, burnt-out tanks, air holes using termite hills and bomb craters. 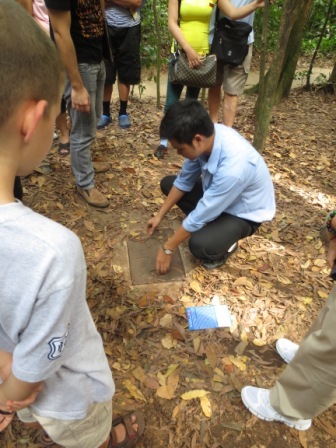 Our guide locates a hidden door and shows us how the Viet Com disappeared into the forest floor. 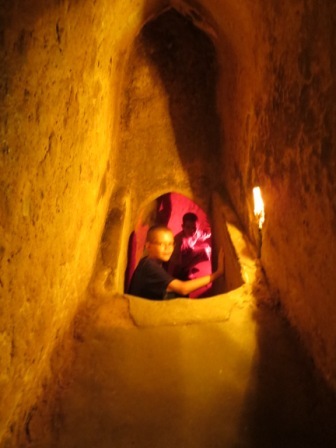 A section of the tunnel system has been enlarged to accommodate the larger size of foreigner. We still struggled through the 150 m section. 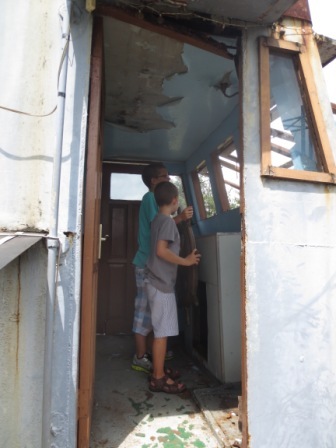 The boys took it in their stride but I panicked about half way through and used one of the escape exits. Very claustrophobic. Bizarrely, at the restaurant area you can fire a rifle or throw a grenade. 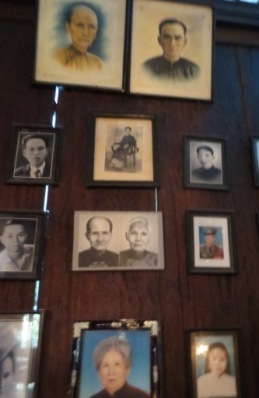 We retire to a less noisy spot next to a bust of Ho Chi Minh himself. Been raining heavily for over a week. A state of emergency called. 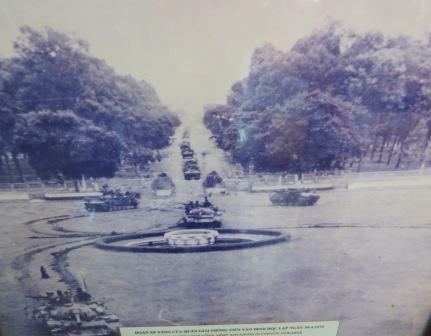 The Presidential Palace flooded. 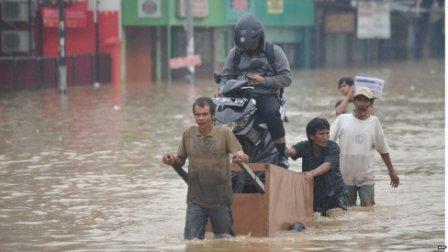 Extensive flooding downtown but we have not been badly affected here in South Jakarta. Distressing footage on local television – it is always the poorest who are hit worst. Incredible photographs on BBC website. 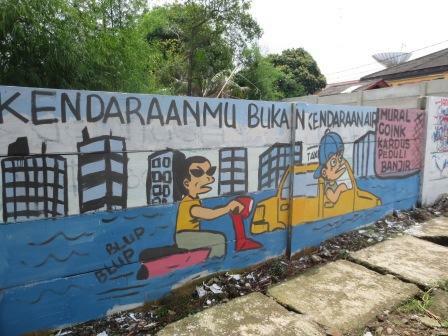 This one is so typical of the Indonesian way – garbage collectors have nothing to collect so use their carts to transport others through the flood water. The scooter rider sits on his machine and uses his handphone. 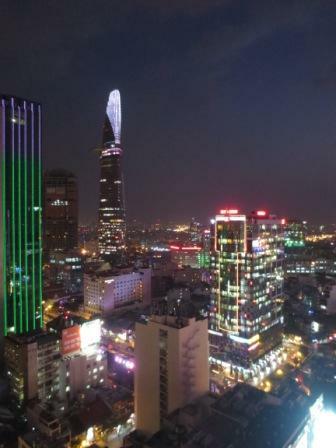 The flight from Jakarta to Ho Chi Minh City took less than three hours. The wait for our visa on arrival took more than two hours. We joined a large queue at the tourist visa counter. We handed over our documents and letter that we had applied for online before leaving home and then waited for… whatever system (if any) the counter team had that evening. Before paying $25 each for a big sticker in our passports we sat on the (clean) floor and waited for our names to be called. 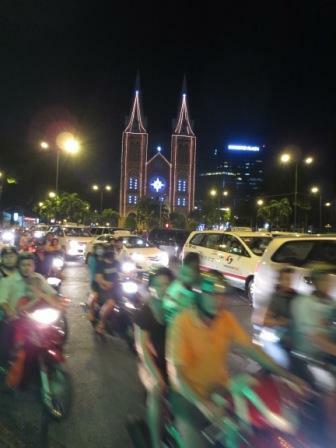 Welcome to Ho Chi Minh. 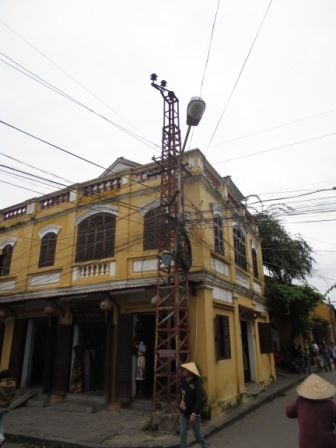 However, this turned out to be our only experience of over-zealous bureaucracy while in Vietnam. We headed for the Indochine Hotel ( http://www.indochinehotel.com/ ). Great, clean wee hotel round the corner from the Opera House. 2 rooms for 3 nights including breakfast for $195. Our first taste of the coffee. Individual filters on top of the cups release black coffee that tastes like… flavoured, milky coffee. Pavements. Traffic lights. No rubbish. No burning rubbish. No smells from the sewer. Difficult taxi drivers who don’t know where any of the major tourist sites are. A very attractive city centre. The next morning we headed out to walk round the city. A very cosmopolitan feel, a warm Glasgow with scooters – busy, noisy but exceptionally clean and ordered. We walked past the Opera House and the Continental Hotel (setting for much of Graham Greene’s novel, The Quiet American), heading towards Notre Dame cathedral. 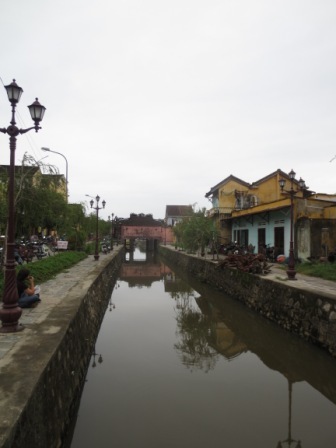 The fictional Phuong could be played in the film by any one of the stunningly beautiful young girls riding side-saddle on the scooters or working in HSBC. Brides and grooms being photographed in the sunshine outside designer label shops. 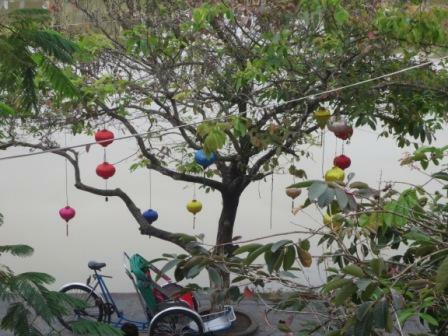 Fantastic New Year decorations being assembled and hung all over town. 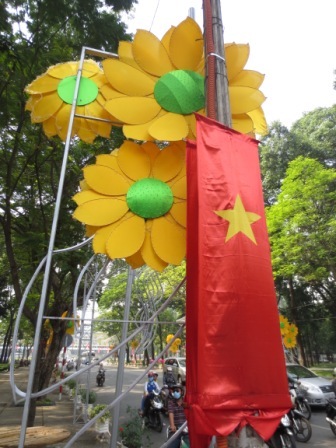 The Vietnamese and communist flag flapping among the signs for the celebration sponsors, Burger King and Heineken. 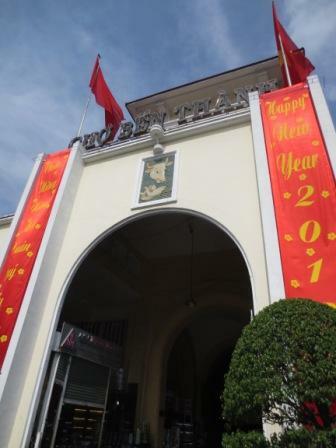 (The Saigon Times Daily headline on January 4 reads, Starbucks to open first store in Vietnam). 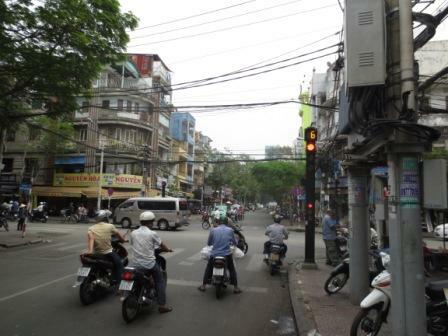 Residents of Ho Chi Minh seem comfortable with all this, the young especially. 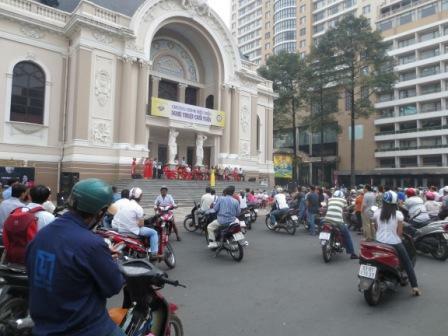 In the city centre they gather to talk, snack, sing and dance in the wide tree-lined boulevards. 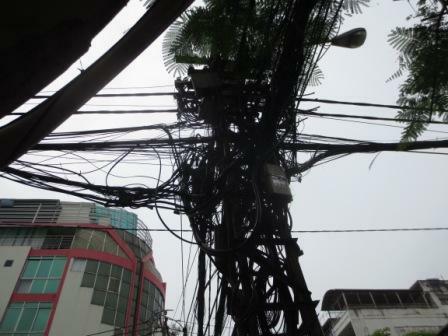 The clusters of amazing overhead power cables add their own kind of all year-round decoration. One morning we were woken with a performance on the steps of the Opera House that stopped the traffic. This seems to be a city and a people not dwelling on the past but gearing up for the future. We discovered that many attractions close for lunch. On the way to the cathedral we crossed the road and visited the magnificent post office. 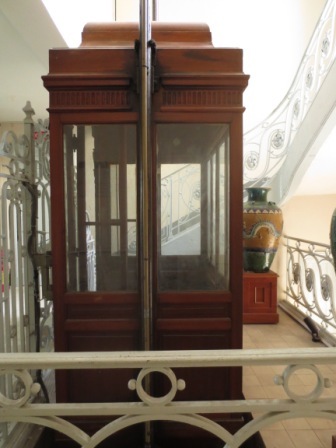 The old individual telephone booths for making international calls remain, some converted to ATMs. The boys bought, wrote and posted some postcards. 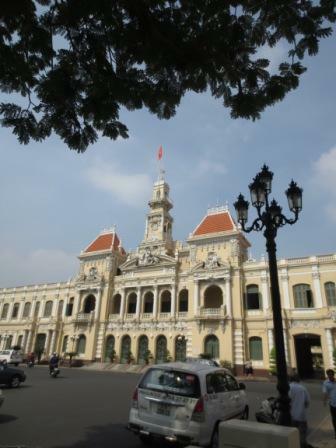 One of the oldest buildings in Ho Chi Minh designed by Gustave Eiffel. 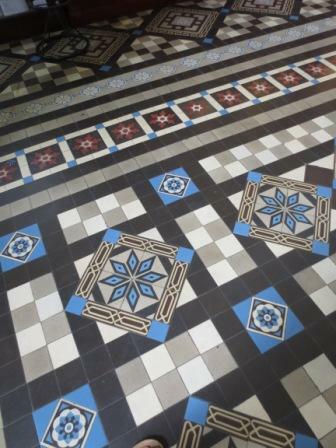 A gorgeous tiled floor – and is that Mr Duong Van Ngo, the last public letter writer in old Saigon? We were just in time to spend a few minutes in Notre Dame Cathedral before it closed for lunch. 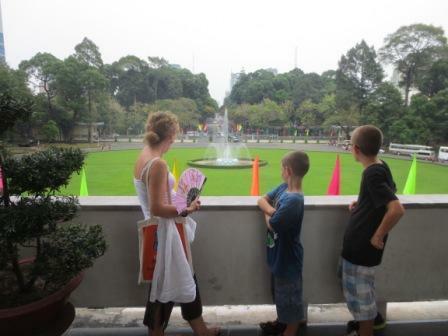 We headed for The Independence Palace but it was closed for lunch. We made for the War Remnants Museum but it was closed for lunch. We decided to have lunch. Just before heading away from the War Remnants Museum Lucas spotted something falling from the rotor blades of an old Chinook helicopter. He sticks the large washer in his pocket and we remind ourselves not to walk under this display when we come back. 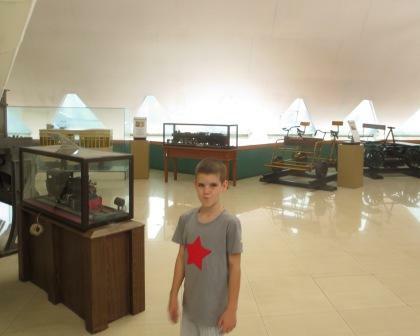 We returned to the War Remnants Museum in the afternoon. 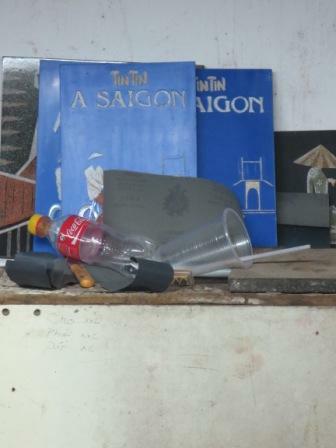 I worried about how the boys would cope with the very graphic photographs and the displays showing the horror of the Vietnam War. Chilling photographs, some of soldiers posing next to corpses and tormented prisoners. Nothing new. 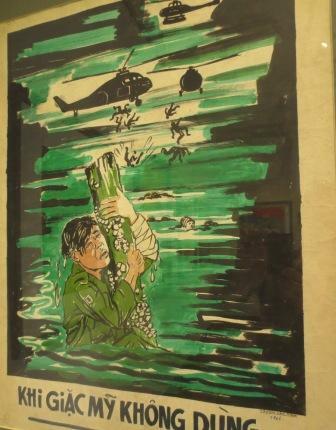 We see the effects of agent orange on both Vietnamese and US personnel. Very moving and the boys cope remarkably well. Being boys, they are interested in the weapons of war but they are obviously moved by the brutality war inevitably encourages. This should be a required visit for any country’s new head of state before taking office. 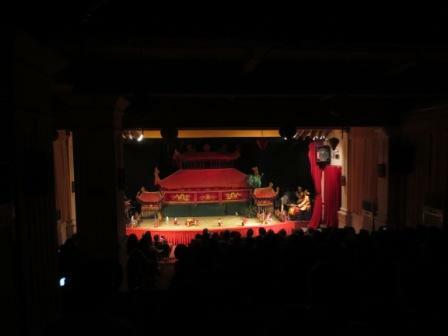 Before heading back to our hotel we bought tickets for the Water Puppet Theatre later that evening. We watched the sun go down on top of the Sheraton Hotel. The water puppets appeared from below murky, milky- coffee coloured water. Dragons breathing real smoke, real fireworks, all accompanied by traditional music and songs. Didn’t quite understand the story and still don’t know how they worked. Just long enough at 50 minutes. The boys were exhausted. Great city. Three pillars representing, creation, conservation and destruction. 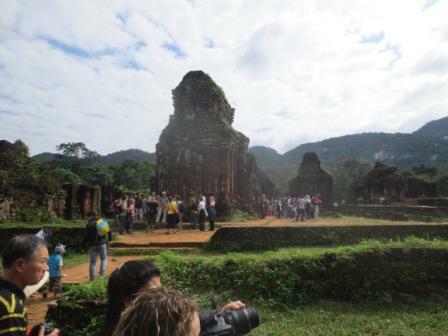 While staying in Hoi An, the boys visited another (Unesco) World Heritage site in the area, the My Son Sanctuary. For $6 each we traveled in a filthy, rickety, diesel-fumed, old bus (with a fantastic guide) and followed the sacred Thu Bon River, through the heartland of the ancient Champa kingdom for about 60 km. We drove up to an elevated geological basin surrounded by a ring of mountains. Abundant paddy fields providing evidence that Vietnam is the second biggest exporter of rice in the world today. 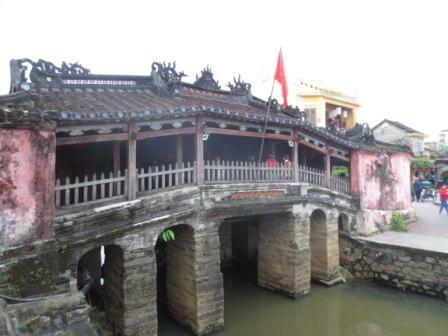 The source of the river is in the mountains and it flows past the monuments at My Son, out of the basin, and eventually drains into the South China Sea near Hoi An. 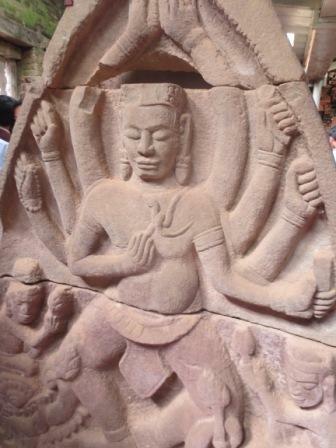 Our guide told us about the Cham people (who originated from Java) and their Hindu culture (especially the worship of Shiva) that developed in the region. My Son dates from the 4th to the 13th centuries. 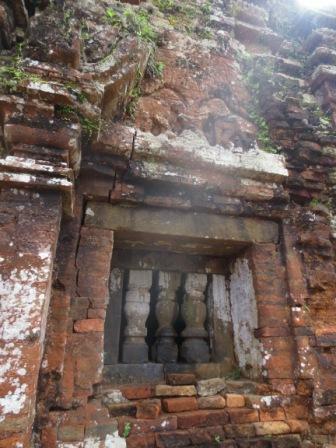 The temples were built over ten centuries by the Cham clans in the kingdom of Champapura (Sanskrit for City of Cham people). Then it went into decline and was forgotten about, became overgrown and covered with vegetation. Because of the sacred significance of the site everything seemed to be left as it was. When the French discovered My Son in the 19th century they found the library still contained manuscripts and statues. 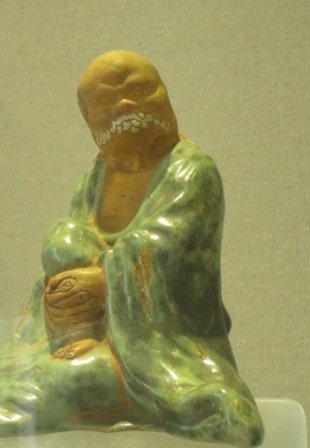 Before leaving their disastrous colonial tenure in Indo-China, they took many of the statue’s heads that now rest in the Louvre. 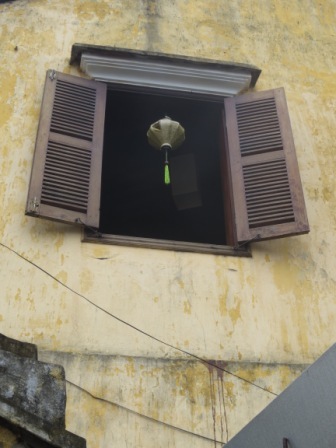 But, they did realise the historical significance of the site and they did try to persuade Nixon and Kissinger not to bomb the site during the Vietnam War. 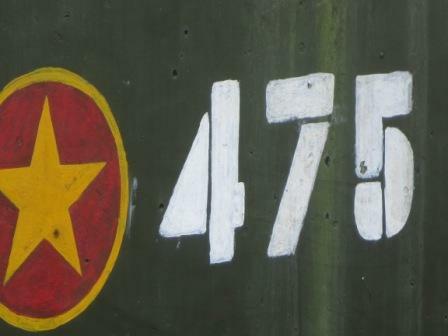 However, B52 Bombers intentionally dropped their loads on My Son (a Viet-Com base) and it was very much destroyed. 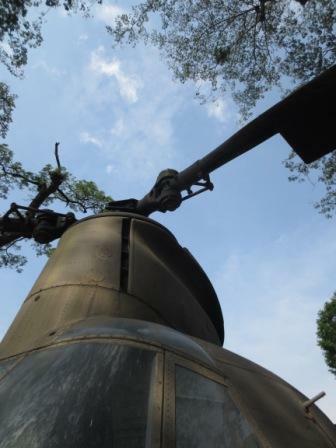 The largest tower put up some stiff resistance, made from sandstone blocks linked together – until the US sent in a helicopter full of sappers to bring it down. 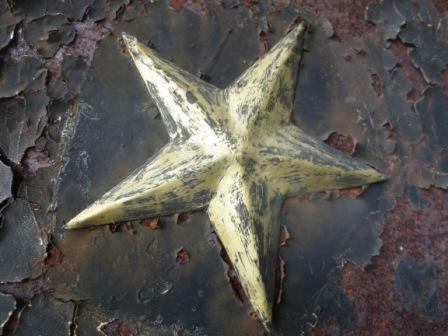 Our guide kept asking, why did the Americans do this? 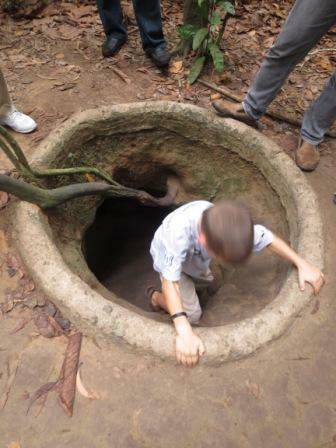 In the late eighties My Son began to attract tourists and with the help of the East German army the Vietnamese managed to clear the site of unexploded ordnance and mines. You can see a couple of B52 shell cases above. 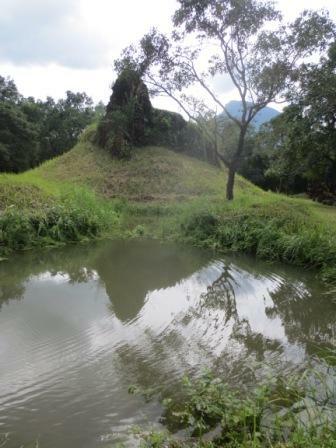 The water filled bomb crater below was once a temple. Some of the amazing brick work withstood the bombings. Indeed, it is still a mystery as to how the Charm people stuck the bricks together. 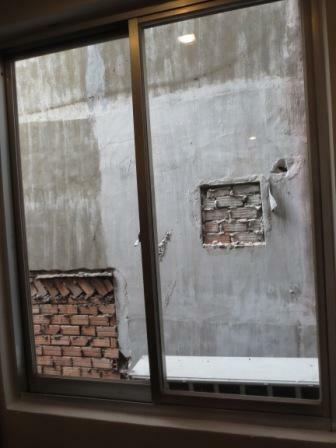 They used no cement or mortar. 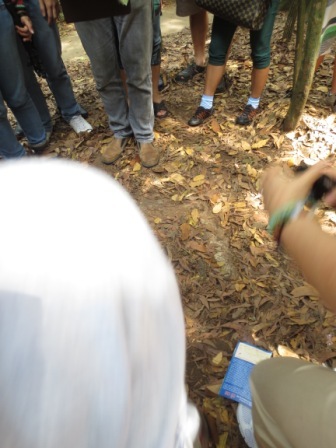 One explanation is that they used tree sap from the surrounding forests. The original brickwork is amazing and continues to survive while restored sections begin to fall apart. 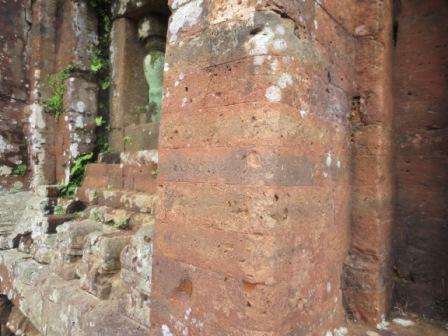 Carving was done while the bricks were still soft in the walls. What was a magnificent creation has now become a major conservation headache – after such mindless destruction. However, a great way to spend New Year’s Day. My sons loved it. Big change in the weather. Sunny and hot. 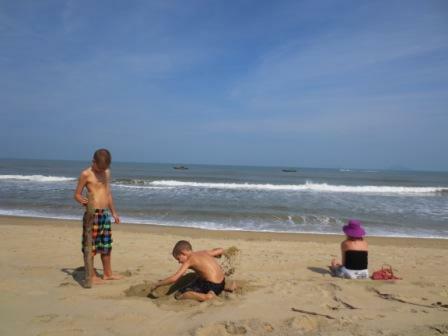 Another great feature of the area was the beach at Hoi An. 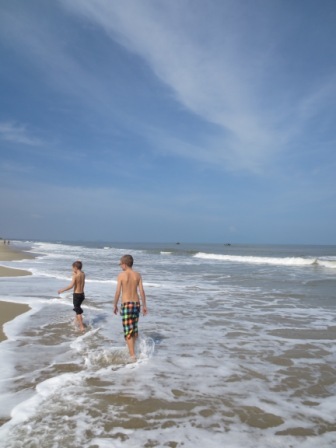 Next day we headed for the beach to walk the endless, almost deserted sands. 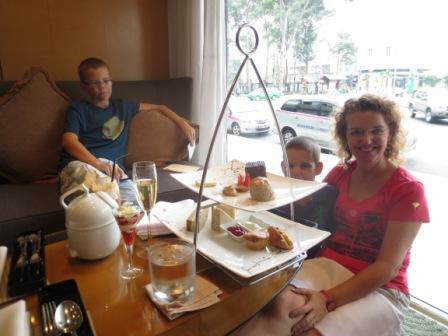 Our favourite family activity. A few holiday makers on sunbeds and some dodgy restaurants in town but then only fishermen. 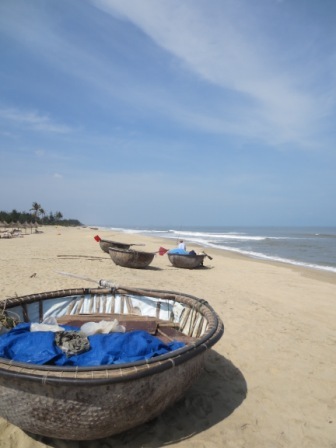 The fishermen use what look like traditional coracle boats. We saw one pair go out battling over the surf and turning, almost pumping, the attached oar vigorously. Fantastic beach with clean sand and no rubbish. Beautiful shells and an exciting surf. 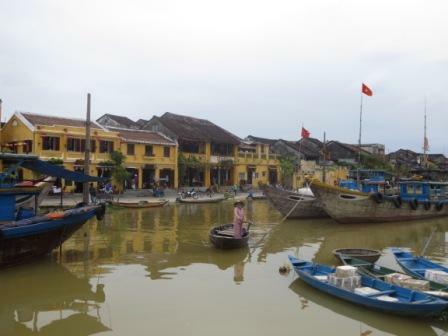 In the 16th and 17th Centuries Hoi An was the international trading centre in Southern Viet Nam. 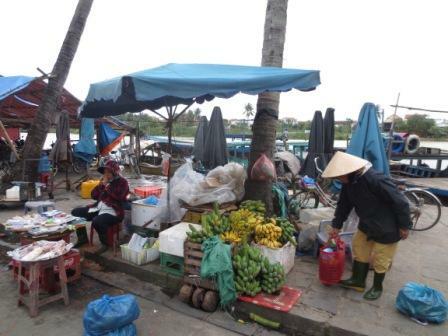 Foreign merchant ships came to Hoi An in great numbers for annual commercial fairs, each lasted from 4 to 6 months. 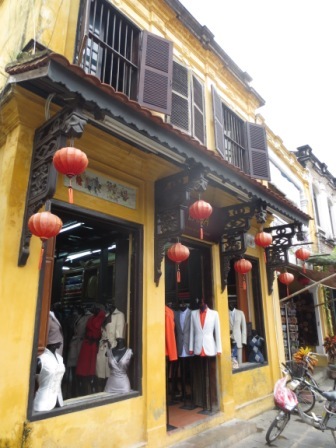 The old town is a unique concentration of old buildings, houses, palaces, pagodas, shrines, temples, bridges, markets and a wharf. 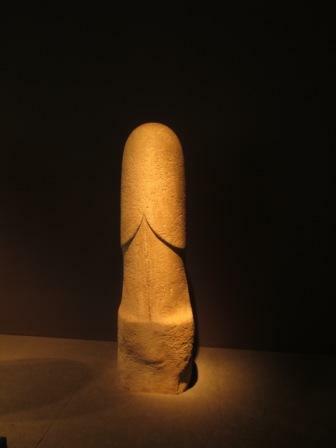 In 1999 it was given World Heritage status. It could be argued that the town is now a wonderful living museum or a theme park where the buildings are all now tourist shops, bars and restaurants going like a modern-day commercial fair. 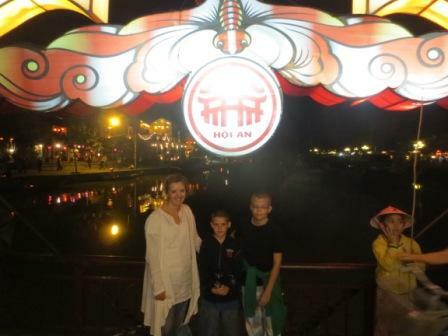 We joined the other 4000 foreigners (according to The Saigon Times) in Hoi An for New Year. We had a lovely time walking around the town and spending money. The food was fantastic. However, when we arrived we were not prepared for the weather, cold and blustery. 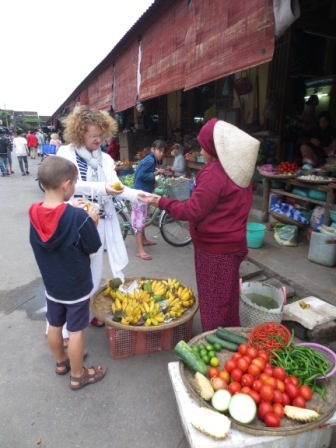 We walked the market, bought some fruit and resisted the many offers of a boat ride. 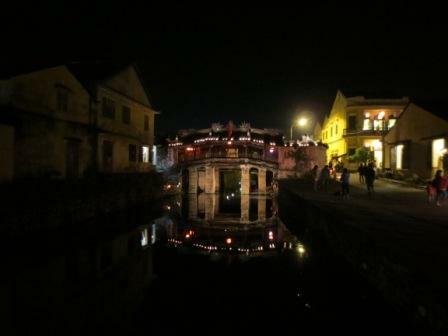 Hogmanay, we visited the town and bought the Old Town Ticket, allowing us to visit five sites in Hoi An. 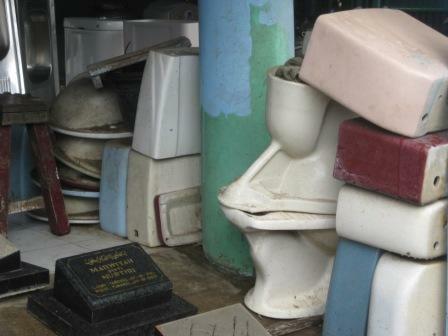 We visit the Tran Family Chapel. 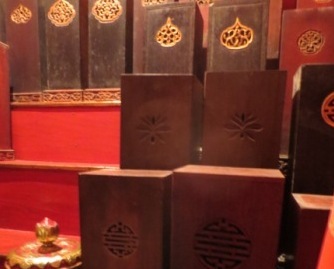 Inside the house is a shrine to family ancestors, a shelf at the back displaying boxes (in the shape of malt whisky boxes) containing a relic of the dead person. Boxes of the same wood a couple, a single emblem on the box to signify a single person. Sadly this stopped when photographs came along. Not the same. A nondescript garden at the back contains the placentas of many generations. 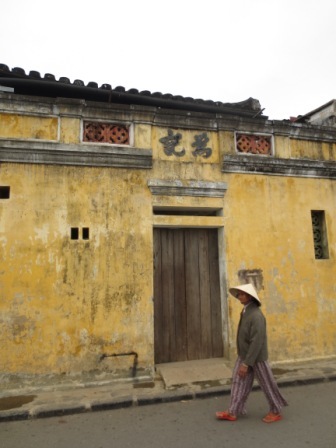 Then we visit the museum of Sa Huynh Culture and then the Quan Cong Temple. 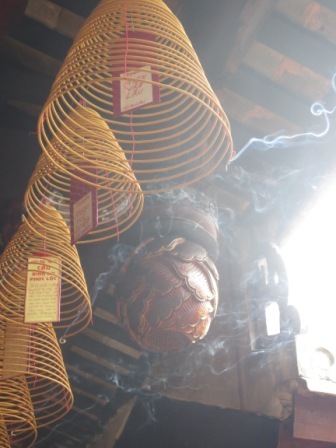 Fantastic incense coils burning with prayer tickets. We donate large amounts of Dong hoping that the caretaker will ring the bell, without success. No dong. 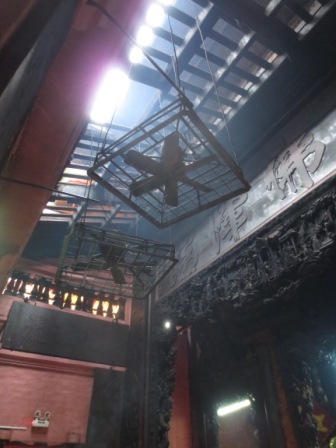 We visit the Cam Pho Communal House to see the dragons on the roof. We save the fifth visit for another day. The Japanese bridge we cross on several occasions. The French were a bit irked by the bridge’s hump so levelled it out. The bridge has been restored. 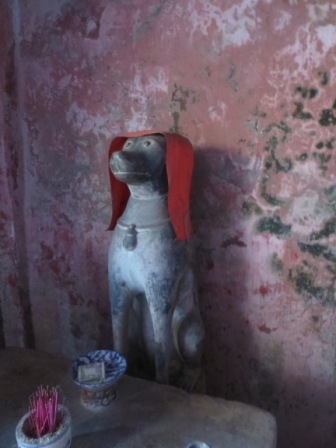 Dogs and monkeys guard each end. 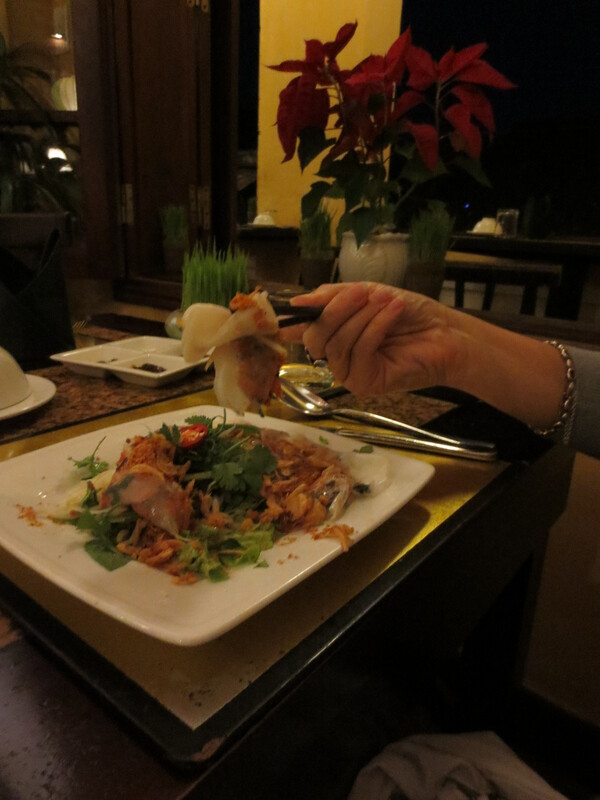 We eat a few evenings in a restaurant called Morning Glory named after the green vegetable that is popular in Vietnam. I have it fried with butter and garlic. Delicious. 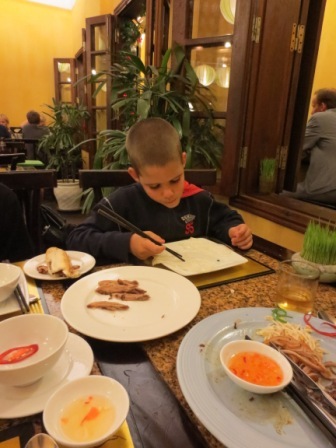 The restaurant serves Vietnamese street food but with class and beer. 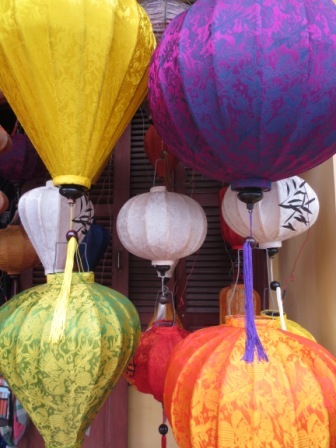 We leave Hoi An with t-shirts, coins, incense sticks, hats, chinese lanterns, toys, jewellery, bags, pottery, kimonos… tourists.